The game is viewed in a top-down perspective and is vertical scrolling. The player does not select plays for either offense or defense. On offense, the player simply receives the ball upon the snap and either attempt to run with the quarterback, toss the ball to one of two running backs, or throw the ball to the one long distance receiver - basically the option offense. On defense, the player chooses one of two players to control, and the computer manipulates the others. The ball can also be punted or a field goal can be attempted. 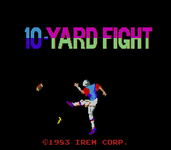 10-Yard Fight has four levels of difficulty; from easiest to most difficult: high school, college, professional, playoff and Super Bowl. If the player wins both halves of an "accelerated real time" 30-minute half at an easier level, the player advanced to the next level of difficulty. Source: Wikipedia, 10-Yard Fight , available under the CC-BY-SA License.